One of the biggest complaints CEOs have about spending marketing dollars is that there rarely is enough data provided about anticipated ROI. CEOs need to have the ability to accurately ascertain the ROI on every dollar spent on marketing. Until now, this knowledge has been elusive. Marketing automation and lead management processes offer CEOs the visibility they require. Why do sales teams ignore more than 80% of incoming marketing leads? The reason is clear; they don’t value the quality of those leads. Companies expend valuable resources to retain sales reps, therefore, the productivity associated with the resources is critically important. CEOs naturally favor ensuring that these resources are used in the most productive ways. Marketing automation can assist in passing qualified leads to sales by providing more sales intelligence. Sales reps can now increase the likelihood of success on incoming leads. Most CEOs are frustrated with marketers who keep talking about brand value and brand equity that can’t be directly linked back to results that truly matter: market valuation, revenue, sales, and EBIT. Although marketing automation doesn’t directly assist with determinations on the money spent on branding efforts, it can help with assessing the ROI of marketing campaigns; this can shed light on how to best spend those branding dollars. The ultimate goal of marketing automation is to increase revenue and maximize resources. Over time, marketing automation should assist in providing warmer leads for sales reps. This ultimately leads to quicker closes. Additionally, greater intelligence and insights provide sales reps with a better chance of finding people when they are actively interacting with the website, landing pages, and campaigns. Marketing automation coupled with a process that spans lead generation will inevitably evolve into a competitive business advantage. Marketing automation is one component that leads to revenue increases, qualified leads and frees companies up from bloated and costly legacy processes. 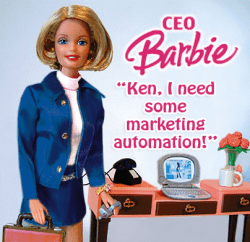 Take Action – Like Barbie! It’s clear that marketing automation can make things easier and lead to revenue increases and qualified leads. CEOs can measure the data provided on marketing efforts, sales costs decrease, and CEOs can understand how marketing efforts affect the bottom line. Once CEOs are able to effectively track revenue increases and see how lead management leads to a competitive advantage, CEOs will be more willing to invest more resources into marketing. It’s time to streamline the sales process and achieve a greater percentage of sales successes. Marketing automation can deliver these results quickly and efficiently. Choose to take advantage of the benefits marketing automation can offer now. Your CEO will appreciate the effort and the convenience this resource can offer. Are you a CEO or C-Level employee that wants to learn more about Lead Liaison’s Revenue Generation Software™ providing marketing automation technology? Ping us! Sources: The Aberdeen study performed in 2009 concluded that 80% of marketing efforts to generate leads are ignored by sales teams.